Animal Friends: Animal Friends' Home-To-Home Adoption Program Presents....Ashes and Soot! Animal Friends' Home-To-Home Adoption Program Presents....Ashes and Soot! Ashes and Soot are 3-year old Russian Blue mix, indoor, short-haired cats. They are micro-chipped, neutered, and front de-clawed. Because they have been together since birth, we would prefer to place them together. They both have beautiful gray coats. Ashes’ eyes are a more vibrant yellow, while Soot’s are a shimmering green. These cats love to play, both with each other and humans. Ashes loves attention all the time, while Soot likes to be petted when he’s in the mood. They are both good at co-habitating with dogs and children. Soot tends to run the other way from kids, but they do not stress him out. Ashes likes to be right in the mix, and has even tolerated some accidental tail pulling without incident. These cats would do well in most any situation, but Ashes in particular needs a lot of attention. We recently had a new addition to the family and do not have the time to give him all of the affection he deserves. 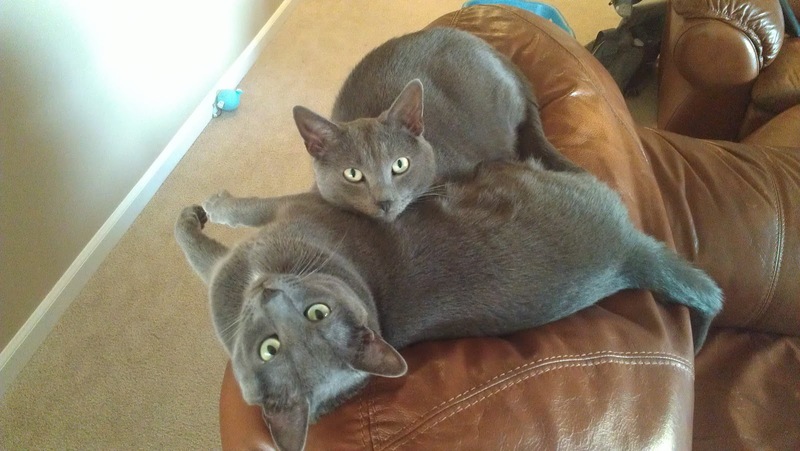 If you are interested in these two wonderful cats, please contact Christine Smerker at 240-994-5737. What a great photo. Our cat looks simular to the Russian Blue. I always thought she looked like a certain breed. Now I know which one it is! I hope they go to an awesome family! Where are you located? I am looking for 2 pets for my parents. They recently lost their 2 beloved cats to old age. My father is devastated , as he is an animal lover. I would like to find 2 , have him meet them first. How does home to home adoption work? They live North of Pittsburgh. We're sorry to hear about the loss of your father's cats. Our Home-To-Home Adoptions program works like this: a pet owner contacts us and provides us with information about their pet that they'd like to place up for adoption, we post this information on our blog. If someone comes across the information and they are interested in the pet, they contact the owner directly. Animal Friends isn't involved in the adoption process at all. If you are interested in Ashes and Soot, please contact the owner, Christine at her phone number in the post. Please know, this post is almost a year old and Ashes and Soot might have found another home already. You can also bring your father here to our shelter, which is located minutes from I-279 on Camp Horne Road. We have plenty of cats who are looking for their forever homes! These posts seem to be very old. Today is 26 April 2014. Are the cats still available? To find out if these cats are still up for adoption, please contact the owner, Christine Smerker at 240-994-5737.